After obtaining his composition degree from the Conservatorio “Giuseppe Verdi” in Turin under the guidance of Gilberto Bosco, Francesco Cilluffo moved to London, where he studied with Diana Burrell (GSMD), Alexander Goehr (Cambridge), Robert Keeley, Silvina Milstein and George Benjamin (King’s College, London). 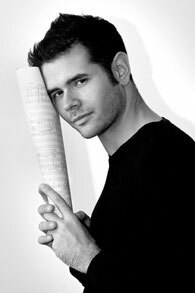 He has also collaborated with Sarah Walker, Rulf Hind, David Adler, Malcolm Singer, Julian Philips, Richard Baker, Julian Anderson, Thomas Adès, Harrison Birtwistle and Jonathan Harvey. In 2007 he was introduced to American composer Tobias Picker, whose music has been influential in his development. Their collaboration has resulted in the commission of the opera Il caso Mortara (during Mr. Picker’s tenure as artistic advisor of the Dicapo Opera Theater, New York). Further collaborations include a new chamber version of Picker’s Fantastic Mr. Fox for Opera Holland Park (London, July 2010). His works have been performed in Italy (RAI, Turin, Rome and L’Aquila Festival, Festival della Valle d’Itria, Incontri in Terra di Siena), Austria, France, England (Purcell Room, The Place and GSMD in London, Cambridge, City of London Festival), United States (New York, Chicago. UCLA Los Angeles), Hong Kong and Moscow. In February 2010, the world premiere of Il caso Mortara in New York received a great success and was hailed by the New York Times’ critic Tommasini as a highly recommended event in the New York Classical Music season. His chamber opera Edward II won the Second Prize at the Fux International Competition Prize, Graz (Austria) in 2007. The Land to Life again, a song cycle for soprano, cello and string orchestra premiered at the Festival Incontri in Terra di Siena and Carmen Artemisiae for chorus, piano and percussion (both premieres in Summer 2012); the cantata for mezzo-soprano, chorus and orchestra Voci di tenebra azzurra, premiered at the Festival della Valle d’Itria, Martina Franca; Drash for the Chicago Arts Orchestra; the song cycle Death in Florence for the London Song Festival; the melodram Il barone rampante for the RAI National Symphony Orchestra (based on Italo Calvino’s book, premiered and broadcasted in 2007); the video-cantata The Other Boat, written for the Electra Ensemble (Amsterdam); a valse for symphony orchestra (Turin Symphony Orchestra); the symphony for string orchestra Castelli di Rabbia (after Alessandro Baricco’s novel, performed during the celebrations for the 2006 Winter Olympic Games) and Suddenly Last Summer (commissioned by the Royal Academy Of Music and conducted by Edward Gardner).